Hello and Happy Weekend although I'll be honest I'm not thrilled about it being the weekend. It just means Spring break is about over, not that I get one but for others in the house soooo. Kind of bummed about that but on the bright side Easter is this weekend which mean beach sunrise! Woohoo!! 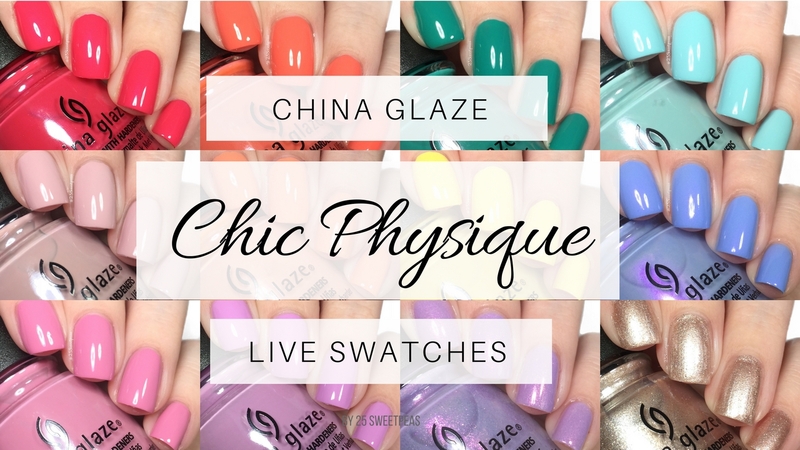 Anywayyyy, today I have the new China Glaze Chic Physique collect to show you and spoiler, I love it! I have swatched of all 12 plus a video so let go! A berry tones pink with a slight shimmer. I love this type of emerald that has a teal feel in it. Its s super pigmented one that is obviously pretty. Most colors like this that I have stain so I was cautious and did 2 base coats again just being safe rather than sorry! :) This one was the only one that had a different formula. This one way a bit more crelly liked but it still covered well in 2 coats. A periwinkle blue creme with a pink shimmer. This is such a nice periwinkle! I love that it has a shimmer in it as you can see in the bottle but I am a lil bummed that you can't see it on the nails. Either way tho, the polish is a lovely shade and has a great formula! A pink toned lavender creme. So impressed with this one and well all of these cremes. I am thinking China Glaze did some formula revamping because these are so much better than their past shades similar to these. This covered so well in 2 coats and had a nice shiny "plump" finish even pre top coat. A metallic like bronze with scattered micro glitters. This is the only "metallic" in the collection and its a nice accent nail, it does have a nice easy to work with formula however it can be brush strokey. The lil micro glitters in it are nice because it makes it a bit different for this type of polish which was nice. Overall this one wasn't my favorite, but it was still a good polish, with good performance. A light lavender with a magenta shimmer running through out. Yesss, this is pretty! I love the shimmer in this one. That magenta flash you get from the shimmer makes this lavender just pop! I would love to see China Glaze do more polishes just like this! I did not expect to like this one in all honesty, however I did. Its formula was sooo nice and creamy which made the application a dream, and it was actually a nice shade on my skin tone. It might help that the tan is returning but still! I was quite impressed. Another great one that I really enjoyed. Its a neat dusty rose pink that looks really nice on and has such a nice formula that I was most pleased with. A light pastel neon like yellow creme. I have never liked a yellow polish enough to wear it on its own, nor to really even get excited about it as a accent nail. Its never been "me". Well things have changed, I LOVE this yellow. It was just amazing from the shade to the formula and ahh, I just love it. Its not too in your face, nor too light, its just right! Plus I mean its also the PERFECT lemon yellow, pineapple yellow, and you know I LOVE those! Another fave! Oh yes, I just love these types of shades and this is nothing new, its just such a nice blue with a minty feel. I just love it so much, China Glaze has always been good at colors like this and now with this new formula its near perfection! So yeah its a new fave! I'm very anxious to try this new formula! I have a few CGs and the pastel cremes don't apply well for me, so this is good news! I love all shades! Right?! I have so many of the old ones and they are gorgeous so I will deal but these are just sooo much better! Get it right get it Bright is my jam!!! Its so pretty isn't it?! What a pretty collection! I like that it's bright, but not neon bright. Definitely, I feel like China Glaze is really good at that! These are so pretty and perfect for spring. Gorgeous swatches. This is tge ki d of spring summer collection CG does so well. Thank you! They really do!!! I've loved numerous spring collections from them! Glamletics and Get It Bright are the ones I hope to find. Pretty collection. Both of those are lovely! Me too! Such a nice mix! I wasn't quite as excited about this collection as usual, but I did pick up the mini set! I wasn't at first but the new formulas really excite me! Hope you enjoy the minis! I need Get it Right, Get it Bright and At Your Athleisure for spring and summer! Yes, yes, yes! Those are both sooo great! There aren't many mainstream collections that I lust after, but this one really speaks to me. Beautiful swatches Sarah! Thank you! Yeah same there are really only 2 mainstream brands collections that I look forward to seeing, this being one of them! The new formulas are great! Such bold vibrant colors in this collection! My eye was immediately drawn to Active Wear Don't care. That one is a beauty! I was wearing it just a few days ago and Its so nice! What a stunning set of Spring/Summer cremes! Right! Really great for both seasons! Amazing swatches, that is one pretty collection! Thank you so much! I agree, they did a great job with this one! I was also a HUGE fan on this collection! And your swatches are gorgeous!! Right!? It was a great one, hope the summer one is just as good! Thank you so much! I am in love with all of the cremes!!! 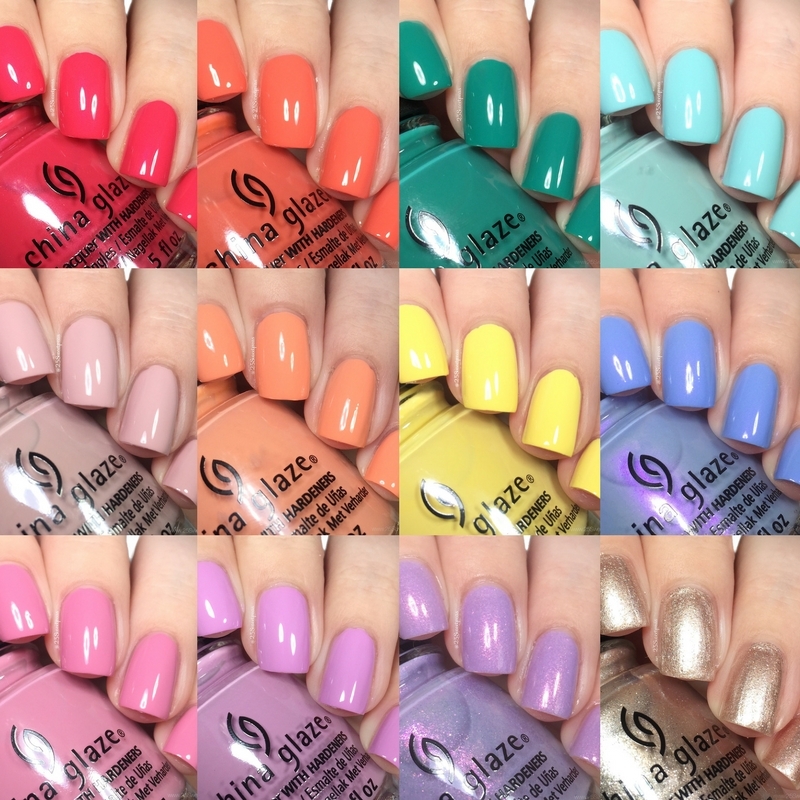 China Glaze has really been knocking it out of the park with collection recently!! !